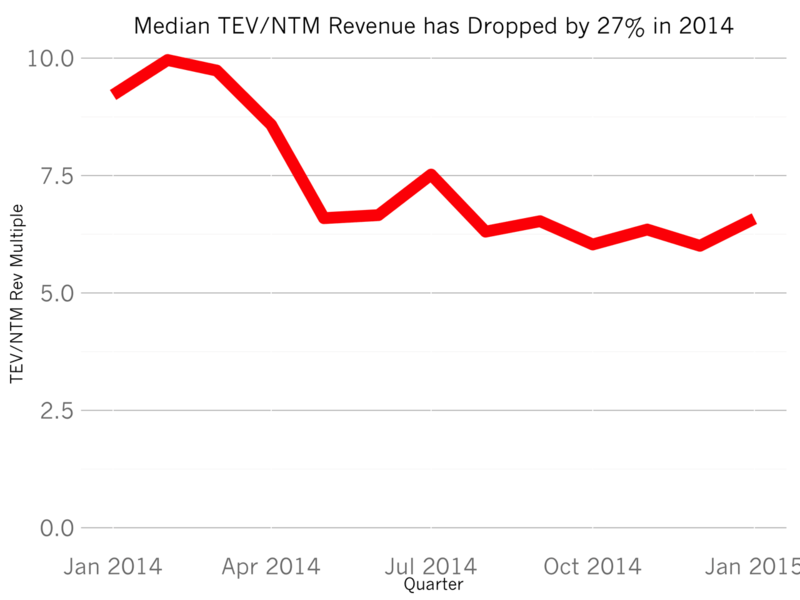 In 2015, SaaS companies trade at a 30% lower multiple of revenue than last year. 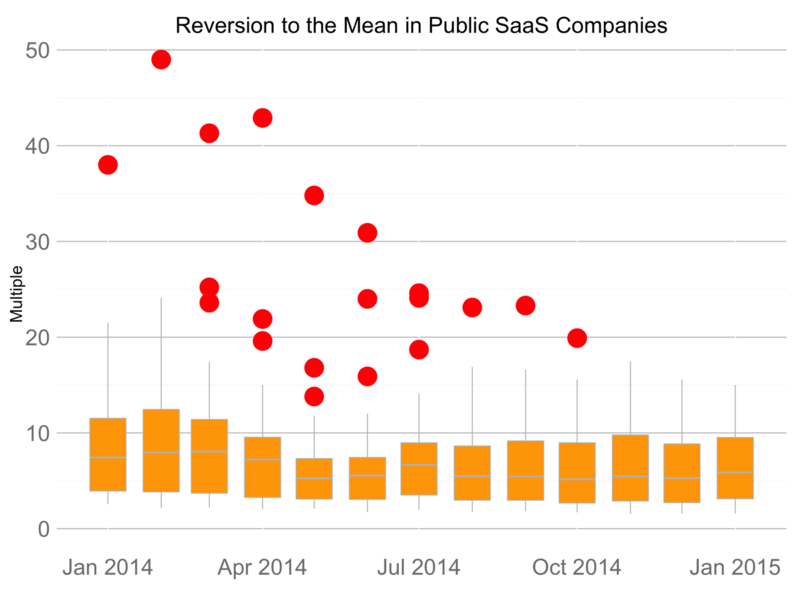 In early 2014, the typical SaaS company traded at about 9.2x their next-twelve-months of revenue. Since August 2014, that figure has dropped by about 30% to about 6.0x. 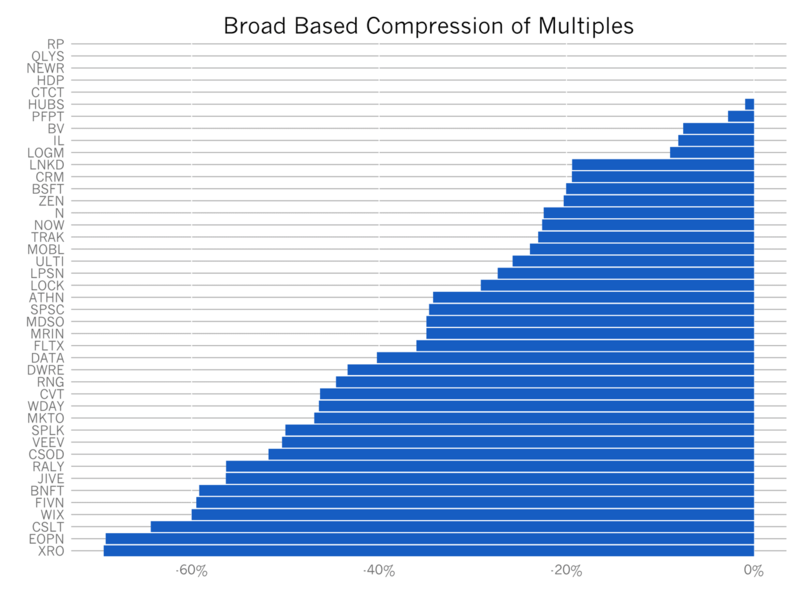 Almost every public SaaS company has seen multiple compression. Only RealPage, Qualys, NewRelic, ConstantContact and Hortonworks are at highs in 2015 compared to 2014. The other companies in this basket have have all fallen between 1% and 60%+. Xero, which once traded at a 50x multiple (!) is down to 15x (still the highest multiple of all). Today, there are fewer and fewer outliers, companies trading at heady multiples, compared to 2014. The red dots in the chart above mark outliers, companies trading at multiples greater than 2 standard deviations above the mean. In the last few months, all the outliers have disappeared - they now trade within a much narrower band: 5-10x next twelve months’ revenue. As far as I can tell, the compression in the public market hasn’t impacted valuations in early venture rounds. Companies are growing faster than ever, a very enticing attribute for investors and higher growth rates command premium valuations. Given the $50B raised by VCs, this year, half of the dollars raised in 2000 and the second highest amount in those 14 years, there’s plenty of cash to chase exceptional early stage software companies and pay premiums to invest. But I wonder if this slow decline will impact prices in pre-IPO rounds and later stage growth rounds for SaaS companies. Or if perhaps valuations will remain the same but later stage investors will demand more downside protection or guaranteed returns when making investments because they can forecast with much greater certainty the upper and lower bound of a company’s value at IPO. “Structure” as it’s called in industry parlance, has been a feature of several rounds in the most recent SaaS IPOs. The data doesn’t indicate unhealthy multiple acceleration, which would have supported the idea of a bubble. Instead, we’re observing a steady rationalization of multiples, indicating investors have reached at least temporarily a consensus on how fast growing SaaS companies ought to be valued in the public markets. The most immediate impact to startups will be in the terms of growth rounds. I doubt these trends will alter early stage investing dynamics much at all.